An 18-year-old female passenger of a motorcycle was killed after the vehicle collided with a Southern Star bus on Sunday morning in Getafe. Police identified the fatality as Marichu Ombayan, a resident of Barangay Salug, Getafe, and her companions as 23-year-old Ruel Torreon and 42-year-old Fernando Torejos, the motorcycleâ€™s driver. 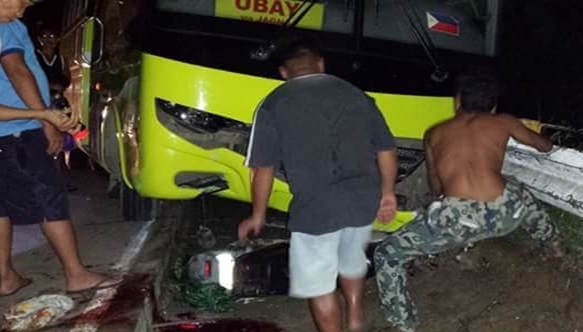 Based on initial investigation, the victims were on their way to the shore to gather shellfish when their motorcycle was bumped from behind by the bus along the national road in Brgy. San Jose. The victims reportedly made a left turn when the Ceres bus crossed over to the opposite lane to overtake another vehicle which was ahead of the ill-fated motorcycle. Torejos and his two passengers were able to make the turn but the rear part of their motorcycle was hit by the bus, police said. The victims suffered severe injuries and were rushed to the Gov. Celestino Gallares Memorial Hospital in Tabilaran City. However, Omabayan succumbed to her injuries past 12 midnight on Monday. The Southern Star Bus Transit Inc has offered to pay for the hospital bills of Torejos and Torreon who continue to recuperate from their injuries.